The two-day culinary event hosted with Eleven Madison Park, and celebrating Surface’s December Art Issue, kicked off Miami Art Week. 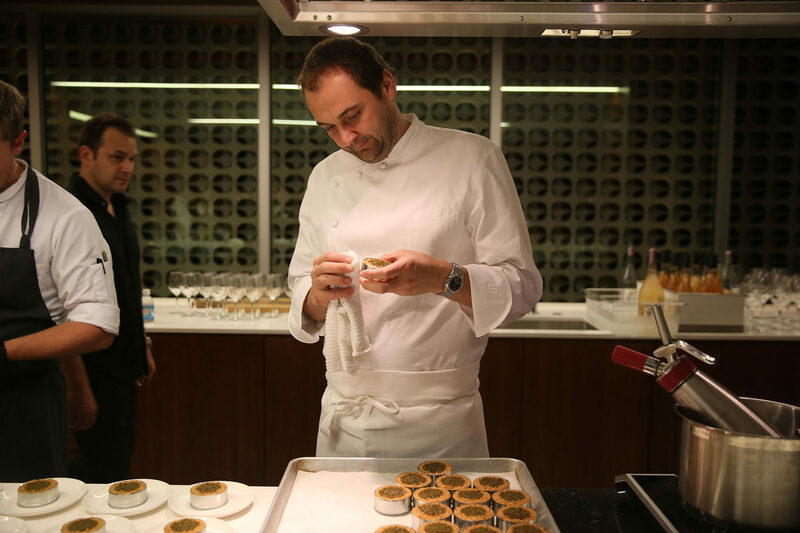 On Monday, Dec. 4, and Tuesday, Dec. 5, Surface hosted the Surface x EMP Experience alongside chef Daniel Humm and his team from Eleven Madison Park, at a Marcio Kogan–designed private home in Miami Beach. The two-day, invite-only event served as a reimagination of the three Michelin–starred restaurant for a special edition pop-up, and welcomed nearly 400 guests in the art and design community, who gathered in celebration of Humm’s cover feature in the December Art Issue. The experience consisted of casual afternoons in the waterfront outdoor space and sunken living room, followed by intimate cocktail hours and seated dinners for VIPs. The daytime gatherings—hosted by Sarah Arison, Zoe Buckman, and Sabrina Buell—offered signature EMP cocktails, chardonnay and red blends from Blindfold and Prisoner wines, and a rosé bar pouring Chateau d’Esclans’s finest. For bites, guests enjoyed classic summertime favorites with an elevated, Eleven Madison Park twist, including the Humm Dog, Dry-Aged Beef Burger, Veggie Burger, and French Fries served with a lemon herb and pommery mayonnaise. The official vehicle of the Surface x EMP Experience was Porsche Cars North America, Inc.; on display on the property were Porsche’s GT3 Cup Art Car, painted by Miami street artist Jona Cerwinske, and the all-new Panamera Sports Turismo. Two additional Porsche models, the Cayenne S e-Hybrid, and the Panamera Turbo, chauffeured VIPs to and from the events. Each night, the home’s second floor terrace, which overlooks Miami Beach’s Indian Creek, was transformed into an exclusive dining space for 50 notables of the art, design, architecture, and real estate industries. The two dinners were hosted by Barry Brodsky, Ximena Caminos, Simon Castets, Stephanie Goto, Raymond Jungles, Bettina Korek, and Kristin and Matthew Whitman Lazenby, alongside chef Humm and Surface editor-in-chief Spencer Bailey. The four-course meal of Eleven Madison Park favorites included Caviar Benedict with Potato and Leek, Pickled Kohlrabi with Asian Pear and Hazelnut, and Beef Roasted with Parsnips and Mushrooms, followed by Milk and Honey for dessert. Throughout the two-day experience, Sonos speakers were integrated throughout the home and played a custom playlist created by the Surface and Eleven Madison Park teams, providing an upbeat and energetic atmosphere for daytime, and transitioning to a relaxed and elevated sound experience for nighttime. Notable guests over the course of both days included Lindsey Adelman, Anda Andrei, Laura Baldassari, Alberto Biagetti, Bec Brittain, Simon Chaput, Alexandra Champalimaud, Sara and Ugo Colombo, Rafael de Cárdenas, Casey Fremont, Alexander Gorlin, Freja Harrell, Misha Kahn, Karen Kice, Winy Maas, Jason and Michelle Rubell, Antonio Sersale, and Hank Willis Thomas. The luxury residence, 4567 Pine Tree Drive—recently completed by Barry Brodsky’s Brodson Construction, and designed by renowned Brazilian architect Marcio Kogan—was opened to outside guests for the first time this week. With dock access to Indian Creek, the house has a series of broad, rectangular spaces that open to merge indoor and outdoor living areas and shape views of the water. The home is set in an all-encompassing jungle-like landscape created by award-winning (and aptly named) designer Raymond Jungles, and complements the prim geometry of the house with a variety of local plantings. Special thanks to Porsche, Sonos, Chateau d’Esclans, and Prisoner Wine Co. for partnering with us on the events. Read the December cover feature on chef Humm here to find out how contemporary art transformed the world’s best chef.